Last month, members of the Detroit Lions took part in a charity softball game at Ernie Harwell Field, on the campus of Wayne State University, two miles northwest of Ford Field. 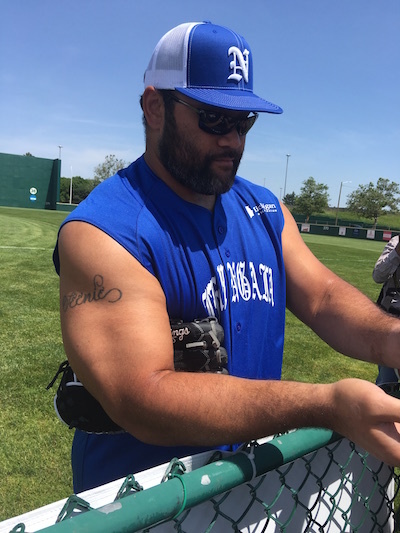 Lance Martinez of My Detroit Sports provides this original photo of Lions defensive tackle Haloti Ngata signing autographs at the event. Now entering his 12th NFL season, the 33-year-old Los Angeles native was originally drafted by the Ravens in 2006, before joining the Lions in 2015. While with the Ravens, the Oregon alum played on some really good defensive teams, including the 2012 Baltimore Super Bowl winning squad. Ngata’s résumé also features five Pro Bowl selections and 29.5 career sacks. Lions fans can view several other behind the scenes looks at the team, provided by My Detroit Sports, over the past few years. Here is Ngata signing, during a 2016 preseason game at Ford Field.